Wait—isn’t 60 percent a solid number showing support for stricter gun laws? Yes, but support is dropping and my guess, like what happened after Sandy Hook, is that support will continue to drop until it returns to pre-Newtown levels: 47 percent. And that was with a Democratic president at the helm. The Gallup poll of 1,019 adults, conducted between Oct. 1 and 10, found 61 percent of respondents support making gun laws stricter. That's down 6 points from when Gallup asked the same question between March 1 and 8. At the same time support for the idea that gun laws should be kept the same increased from 28 percent to 30 percent and support for the idea they should be made less strict doubled from 4 percent to 8 percent. Support for stricter gun control has wavered significantly over the last few decades. When Gallup first asked about it in 1990, support for stricter laws came in at an all-time-high of 78 percent. In 2012, support hit an all-time-low of 43 percent. Support for stricter laws has trended back up since 2012, but this month’s numbers may indicate it is receding once again. These kids suffered an unimaginable tragedy. It’s their right to hit the streets and push anti-gun initiatives. I get it. 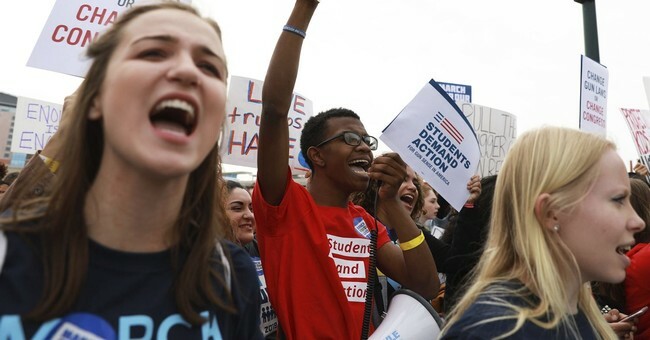 I support their right to do so, but whether these young anti-gun activists know it or not—they’re leading an assault on our Constitution. They want to ban AR-15s, a perpetually absurd talking point from the anti-gun Left, which is a universal Democratic Party position. But what they probably don’t know is that the Democrats want to ban all guns. They want to destroy the Second Amendment, and any ground ceded in this fight will be used as a foundation to chip away at Second Amendment freedoms even further. The more this issue marinates with voters, the less popular it becomes. And Democrats keep thinking that this is a winnable issue for them in campaigns. If that were the case, incumbent Florida Democratic Sen. Bill Nelson would be leading big league in the polls. He’s not. In fact, he very well could lose his re-election to Gov. Rick Scott. Gun rights supporters vote and vote often to protect their rights. Anti-gunners say they’re going to vote but don’t—and create a lot of noise. Which side do you think has had more success in the electoral and policy battlefields?